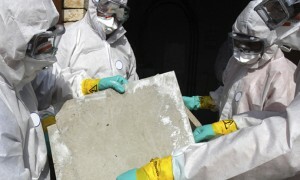 AQHI Inc. is your one-stop contractor for all kinds of asbestos removal in La Verne CA. Prior to the 1970s, many different building materials were made with asbestos. For example, asbestos was often used in flooring, acoustic ceiling texture, roofing materials, cement, and mastics. Today, we know these materials are unsafe. Fortunately, AQHI Inc can help you neutralize the health threat posed by asbestos building materials by providing professional asbestos removal in La Verne CA. New and intact, asbestos-containing materials do not pose an active health threat. But with age or damage, these materials can begin to release asbestos fibers into the air. If an individual inhales air contaminated with asbestos fibers, they may eventually develop life-threatening conditions such as mesothelioma. Why Can’t I Do My Own Asbestos Removal in La Verne CA? Secondly, untrained individuals can actually leave a property in worse condition than they found it after attempting an asbestos removal in La Verne CA. Without the proper sealed work zone design and safety protocols, significant amounts of asbestos dust may be generated during removal activities and can easily spread throughout the property. Finally, you cannot dispose of asbestos waste safely on your own. You can’t just leave it out for the garbage man and you can’t take it to a facility yourself either–you must have a hazmat transporter license for this activity. With such severe health consequences attached to a bungled asbestos removal in La Verne CA, why would you ever want to tackle this kind of project yourself? You can rely on the experts at AQHI Inc. to handle everything for you. We complete all work to the highest possible standard including adhering to all relevant state and federal asbestos regulations. Acoustic Ceiling Removal: Removing ceiling texture takes special skill because the material cannot be wetted down to minimize fiber release, and any asbestos fibers that are released will immediately become airborne. Fortunately, we can compensate for this by sealing off the work area completely, using high-quality air filtration, and following decontamination procedures when workers leave the work zone. Our asbestos removal office for in La Verne CA is open Monday through Friday between 8:00 AM and 5:00 PM and closed for lunch from noon to 1:00 PM. With advance notice, projects can be scheduled for weekends, early mornings and evenings.